If you’re “sleeping with the enemy” by listening or organizing your audio files with anything but iTunes it may just give you the silent treatment the next time you go try to play a “tainted” file. Apple has left this incompatibility in iTunes and the iPod’s operating system with the mentality “If you’re not listening to your music in iTunes or your iPod your not listening to it at all.” If you’re using iTunes you probably have an iPod, so that’s ok most of the time, but if you accidentally open something up in Windows Media Player, or want to use one of the many MP3 tagger and organization programs available, you should be able to without fears of reprisal from Steve Job’s money maker. Most of the remixes we’ve made for other people over the years except for the one for Einstürzende Neubauten because we lost it and a few we didn’t think sounded good enough or just didn’t fit in length-wise, but including some that are hard to find because either people forgot about them or simply because they haven’t been released yet, a few we really love, one we think is just ok, some we did for free, some we did for money, some for ourselves without permission and some for friends as swaps but never on time and always at our studio in Ghent. To address these issues and add flexibility to embed things like lyrics and album art a standard was created to enable storage of data inside the MP3 file (encapsulated in something called an ID3 tag.) This standard has changed over the years, but the last time it was updated was 1999, and iTunes was released in 2001, so don’t count on Apple ever supporting or implementing it properly. 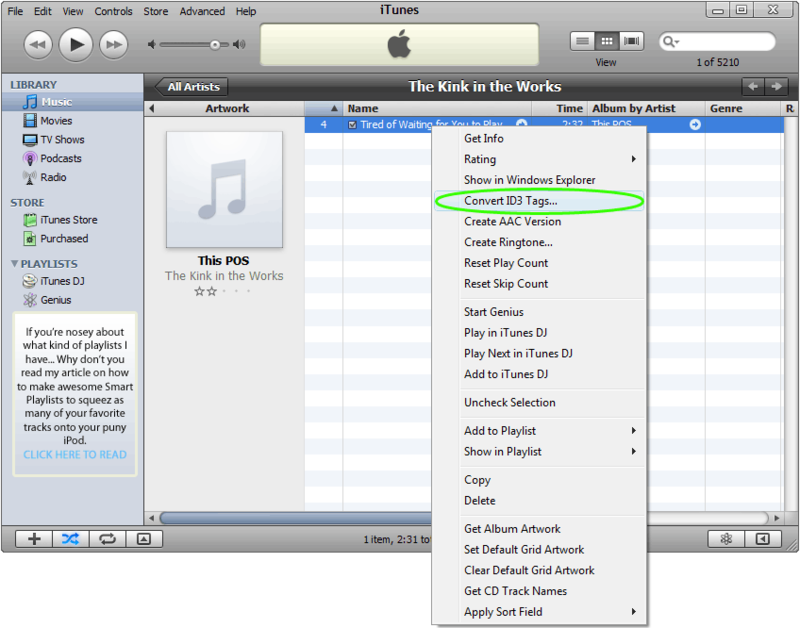 Some programs write tags that are incompatible with iTunes propriety tags. Microsoft’s Windows Media Player is one of many such applications. Step 2: Select either 1.0 or 1.1 in the version pull down menu, if the Reverse Unicode option isn’t grayed out, check that off as well, when you’re done click OK. Step 3: Enjoy your “repaired” song by playing it normally. The next time you sync your iPod the file should be repaired as well. Next to the green Apple display in iTunes, click the List View button (first on the left). If you’re still having trouble playing your files, want to check for and delete duplicate and missing files from your library, check out iTSfv – iTunes Store file validator, it’s FREE and open source. Even if you’re not having trouble, it’s pretty much the iTunes swiss army knife and I highly recommended it. Thanks. This fixed my issue – I looked at dozens of sites. 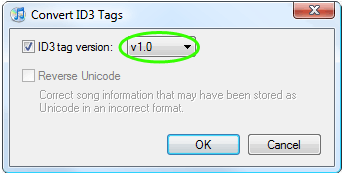 Some mentioned converting the ID3 tags, but suggested version 2.3. 1.1 did the trick for me. My iPod is a 4gb Nano 3rd Gen – aparently this is more common on the nano than other iPods. My iPod is a 4gb Nano 1st Gen, I was unaware of Nano’s being more susceptible to ID3 tag issues, either way the “bug” should be fixed in iTunes. I have tried this and click “ok” but the songs will still not play. When I go back to “Convert Id3 tags” again, my selection has not saved. It will not save. I have the same problem as Chris. Any suggestions? The song would play in itunes, but not on my ipod. I converted it to 1.1 and it worked! Thanks. This post was very helpful. Click on text format, that will un-gray reverse unicode, then click on that. it worked for me with most recent update and ipod touch. Testing Gravatars and http://www.solvemedia.com/ CAPTCHA widget. I know this thread is old but this fixed my issue of certain songs skipping playback on my iPod Nano 7G. Found other threads recommending many other different solutions and none of them worked. Changing the ID tags to 1.1 solved it. Thank you!